If you are familiar with GNU/Linux-based operating systems, you have almost certainly heard of Wine. This great project allows you to run Windows applications without the need of installing a virtual machine. 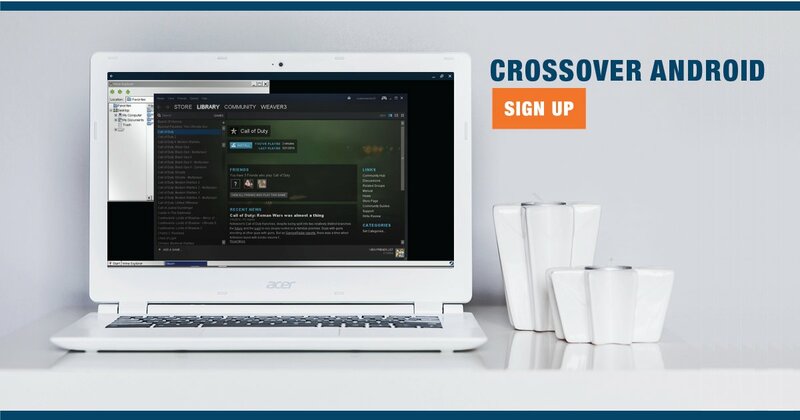 CrossOver Android is a similar concept, but it’s made for Android tablets and Chromebooks running Intel hardware to allow these platforms to run full-fledged Windows software. The latest alpha build, version 4, has been released with support for Android Nougat. We now support Android N! Several fixes for Office on Chromebooks are included in this release. We also now support 64-bit file offsets, allowing for use of very large files. CrossOver’s UI has further enhancements, and we have improved our feature for gathering debug logs during testing. Although the hardware within Intel-based Android tablets or Chromebooks isn’t sufficient to run many modern Steam games, there are still plenty of Windows games and applications that you can take advantage of. You can easily use Microsoft Office 2013 or play some lighter games for Windows. CrossOver looks like a decent solution for those users who need Windows just to run a few applications. Chromebooks are cheap and relatively efficient devices, so enhancing their compatibility with CrossOver seems to be a wise decision. Just note that as of now, only the Acer R11 and Pixel 2015 Chromebooks running the Developer channel can use CrossOver Android until the project expands support for other Chromebooks that support Android applications. If you do have a device that supports CrossOver Android, all you need to do is sign up for the preview on the project’s website.